Hello and welcome to our Summer Newsletter! 2016 has been a full time for us here at ICC so far, with some vibrant and exciting developments as well as some deeply challenging terrain. As many of you know, one of our beloved Managing Directors and lead teachers, Kevin Snorf, sustained a serious concussion this past January while practicing Jujitsu. We’ve heard from so many in our community expressing care and concern and we’d like to offer an update on Kevin and share with you an initiative that some graduates have pulled together as a way to contribute to him in this difficult time. On January 2nd, Kevin sustained a concussion practicing his long time martial art, Jujitsu. 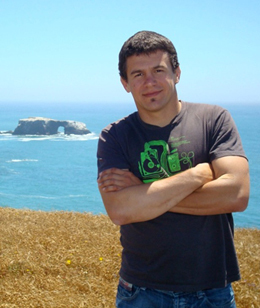 As many of you know, Kevin is a Sensei in Jujitsu and much loved martial arts teacher. In the week following his injury, his symptoms increased in severity until he was unable to work and has been attending to his healing ever since. With amazing support from his wife, Tami, family, close friends, and a host of healing professionals, Kevin has been diligently attending to his recovery day by day by day. His progress is steady, but slow. A few months ago, Kevin was accepted into a program working with concussion specialists at the University of California – San Francisco who’ve been supporting him in developing and carrying out a plan to manage his symptoms and aid in his recovery. He’s also been getting support from a range of health care professionals, Chiropractor, Osteopath, Naturopath, Acupuncturist. All of this is collectively helping. The symptoms he’s been navigating have been severe headaches, nausea, disorientation, decreased coordination, and some challenging emotional and psychological symptoms. He has been unable to work during the past six months and will be unable to work in the immediate time ahead. We have been in close contact with Kevin’s progress mostly through his incredible wife, Tami, as Kevin has been unable to engage with activity outside of his immediate recovery. Needless to say, our hearts have been heavy during this time as we deeply love our Kevin. Tami tells us that on his good days he's still very much his funny, insightful self and can poke fun at himself and the whole situation. His tagline these days is a quote by Marilyn Monroe - "Sometimes things fall apart so that better things can fall together." In every aspect of his life, Kevin Snorf gives everything of himself, so that others may benefit. Whether directly or indirectly, the great majority of us in ICC have received the gift of his devotion to others. This is a time for the tide of generosity to flow back to him. He hasn’t been able to work since the accident, but the medical bills continue to mount. Knowing of this community’s love for Kevin, I asked him whether we might launch a fundraising effort to help him with his medical costs, which are estimated to be at least $13,000US this year alone. Kevin graciously, though hesitantly, agreed. Andrew Leonard, a grad of the most recent MCM, has generously donated his time and talent to create a crowd funding website for his medical costs. Please consider contributing whatever you can to this man who has given so much to all of us, to ICC, and to the world. Click here to go to the site. Our deep gratitude to Leslie and Andrew for creating this opportunity for all of us to contribute to Kevin. We love you, Kevin, and may you continue to steadily recover! We love you too, Tami, and thank you for all that you are doing to support the healing of your sweetheart. May you both be deeply well. 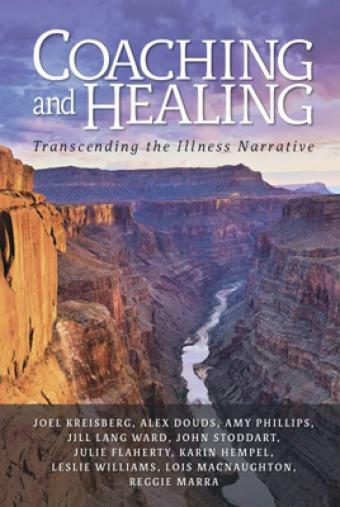 Coaching and Healing- Transcending the Illness Narrative. It looks like we have a bit of a theme to this update…health and healing! In what ways can we be of greater service in the relief of suffering? What initiatives might we enact to bring our ideas and our gifts into the world with more power and grace? How can we move from a personal to a global perspective? Integral Coaching® founders, Laura Divine and Joanne Hunt, planted the seeds for this book when they posed these questions at our 2012 Mastery Workshop in Ottawa, Canada. John Stoddart wrote the words “Coaching and Healing” atop one of a dozen or so blank posters hanging from a conference room wall that day back in April 2012. Nine of us chose to join him to explore this topic – not knowing where we might go together. We wondered how we could deepen, strengthen and hone what seemed a natural connection between coaching and healing in our own lives and in our coaching practices. We were also curious about a bigger picture. What could we offer our fellow coaches around the world? And how could we contribute to the broader conversation about health coaching as it emerges, a vital new modality within the healing arts and sciences? Coaching and Healing is the product of our remarkable collaboration – ten coaches from across North America, meeting monthly, online, over four years. At the outset, we realized how much we enjoyed simply coming together with our shared purpose, many of us with profound experiences with health challenges, many with equally profound experiences with healing, and as healers. Supported by our varied backgrounds in business and organizational leadership, project management, education, writing, medicine, and law, we forged a dynamic, heartfelt and resilient alliance. We opened our meetings with poetry. Reggie Marra, with life-affirming authority, selected and read each poem, then guided us through a few minutes of free writing and free sharing. Surprised and delighted by our discoveries, we would sink together into the world of the poem, our vulnerabilities stirred and our attentions sharpened. Poetry helped us shift our highly personal experiences into the universal, and that connectedness informed each step of our work. First proposing that we write a paper for our coaching colleagues, Joel Kreisberg defined and focused our energies and our goals. From that initial paper, through presentations, and finally this book, Joel provided the compass points and driving force to move our project ever onward. We hope Coaching and Healing will reach and serve coaches of all stripes, along with their clients. 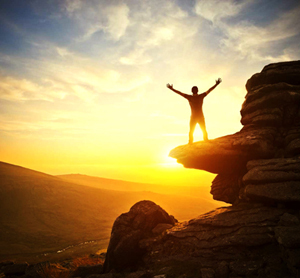 We wish to give physicians, health care practitioners and their patients, an intimate understanding of the power of coaching to support treatment and help chart a healing path though illness. And for everyone in the fields of health and wellness, in care homes and hospices, even teachers and students of life-writing, we offer this book as a testament to the spark of transformation residing within each of us. We dedicate this book in memory of our colleague and dear friend, Jill Lang Ward, who healed, and encouraged healing. July 31, 1952 – May 26, 2016. We at ICC would also like to acknowledge and lovingly remember Jill Lang Ward. Jill was an extraordinary being who exemplified living with grace and grit throughout her long illness. Through the hills and valleys of her last decade, she showed up consistently for others, for her family and friends, for her own joy and spirit of abundance, evidenced to everyone who knew her. There was nothing like seeing Jill’s grinning face at every Mastery Workshop…a sense of “I’m still here! I’m still rocking out this life! I’m having the best time!” We will never forget you, Jill. And we are glad that this new book lives on with your name on it. Back in February, we launched a Global Online Summit with over 30 Integral Master Coaches™ in interviews and panels, sharing wisdom and perspective about cultivating resilience and extended your reach and impact in the world. We’ve had such an incredible response from this initiative from all corners of the world, including many people requesting it be made available again. So we’ve now updated the website so that you can purchase this incredible collection at any time and watch all the videos in your own time! If you haven’t yet engaged with this material, please go check it out. There is so much wisdom and insight offered from this diverse group of graduates with over 40 hours of amazing conversations. In these times we could all use any help we can get in continuing to develop our own resilience so that we can all keep on manifesting in ways that deeply matter to us, in ways that alleviate suffering (including our own) and contribute to the ongoing evolution for these times. There are also bonus interviews with ICC’s Founders, Laura and Joanne. Have you been to our Facebook page yet? Get a taste of the powerful interviews we conducted with them by checking out one of our latest Facebook post. You can find it here. ICC in the House at IEC! Building on the first event two years ago which laid the ground work and helped build the European Integral community, this event in Hungary really set Europe firmly on the Integral map as an emerging creative force in the world. With over 400 participants and nearly 150 presenters there was lots of see and hear from the latest on Integral theory and applications throughout Europe and the world. ICC was solidly represented with loads of Integral Associate, Professional and Master Coaches™ in attendance and many were showcasing their work and applications of our Integral Coaching® method in many different ways. I myself had the great privilege of offering two sessions directly introducing our methodology to new and interested integralists, as well as hosting a lunch table where we had some really rich and dynamic discussions between graduates and potential students. The overall feel of the conference was very positive and had a heavy focus on Teal organizations and communities, and how to build them. It helped me see how blessed I am to have such a diverse and evolving Integral Coaching® community around me, with lots deep and intimate connections as well as inspirational Teal leadership at the helm guiding us forward. 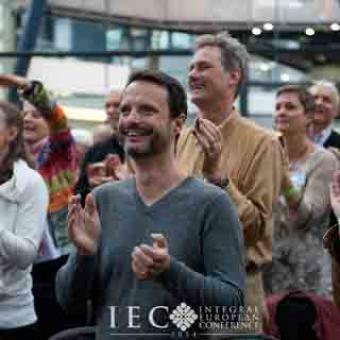 So many at the conference were longing for a dynamic and loving practice community which feels so normal to us here at ICC, how lucky we are, truly. It was also extremely interesting to see just how much of the conference was focused on levels of development, I would say around 70-80% of what I saw. There was some mention of lines and quadrants, a little on states, and types seemed to get lost along the way. Everything presented was very useful and I learned a lot personally from it all, but as Ken says, it was all true and partial in its approach as so much got left out or not fully included. It really helped me see, feel and get at a deeper level of the power of a full AQAL approach and how impactful that can be when skillfully applied. Levels of development can be so seductive and seem like such a powerful leverage point when looking at the world today and seeing what needs to shift, but there is so much more nuance to understand and embody to be able to offer a really integral approach to change and development. I am so grateful for our use of a full AQAL Constellation™ and an include and transcend developmental methodology in guiding our work together as coaches and as a community of practitioners. I left feeling uplifted, energized and proud to be European in this troubled and complex world in which we live in. Europe is living proof that there can be unity within diversity while simultaneously honouring the uniqueness of all involved. What will the future be for Europe? Will it be Teal, (or Yellow as Don Beck insisted in his Keynote speech), or will we find our own new way of being together, working together and loving together? Only time will tell. I loved seeing so many coaches there and look forward to seeing you in the ICC classroom in Europe in October! Until then!! Since the beginning of 2016, we’ve kicked off two Associate Certification Modules, one Professional Certification Module and our second Master Certification Module. Over these months, we’ve also been gathering and connecting as faculty teams to continue to advance our own skills and to deeply connect and support each other as we engage fully in supporting our ICC students and evolving graduate community. We, as a team here at ICC, are continually awed by the hearts and wisdom of those who are engaged in our training, bringing so much to a world that can really use all of the care and skillful means it can get right now. Deep bow and encouragement to everyone who is currently steeped in this training... in ACM, PCM and MCM. Inaugural MCM completed! Congratulations to all the graduates! Our First Master Certification Module completed this past April, with a full class of 20 credentialed Integral Master Coaches™! This marks a very exciting time in ICC as the completion of this course marks the full circle launch of ICC 2.0 in the form of our 3 module Integral Coaching® Certification Program. We’d love to offer a huge congratulations to these graduates and may you continue to do great work in the world! Welcome to the MCM graduate community: Andrew Leonard, Batia Winer, Catherine Holmes, Claudia Villamarin, David Buettner, Erkki Vedder, Ginette Chouinard, Jamie Kearney, Jennifer Thompson, Joan Ermelbauer, Kathy Ogle, Kris Rowe, Marcelo Eduardo Souza, Maryse Shaffer, Matheus Ferreira, Sharon O’Leary, Stephanie Ruder Schoof, Tegan Brophy, Tracy Poirier, Usu Mallaya. We’re back in Vancouver, baby! It’s been a few years since ICC hosted a course in Vancouver. Chela Davison is excited to be teaching the Associate Certification Module November 14-18 in her home city of Vancouver. Let folks know about it! We are back on the west coast of Canada! November 21-23 In Ottawa, Chris Alder will be teaching Integral Coaching® Fundamentals, a 3-day course that introduces the fundamentals of the Integral Coaching® method to new and experienced coaches. This is a great course for those interested in learning about Integral Coaching® and how to apply it in everyday conversations and a variety of contexts. For professionals who want to advance their skills, people looking for a taste of what coaching is and provides, this course is rich with experiential learning and practical application. For Certified Integral Coaches™ who are looking for their next developmental opportunity, consider Fundamentals. This course is more than an entry point into this work, as you’re learning to scale the method, engaging an intake and an offer in a single conversation which many have found advances and expands their offering as an Integral Coach™. To find out more and to register, go here.